This week has seen the first proper sun we've had in ages, and what seems like the start of the British Springtime. The days are warmer, the blossom trees are out in bloom, and Notting Hill is being blessed with a plague of bloggers after the perfect floral instagram snap. I thought I'd trade in the colourful houses of the infamous west London suburb, for a more classic backdrop for this weeks blog post, and the first of my springtime outfits - yes I did head out without a coat! (all items linked at the below). 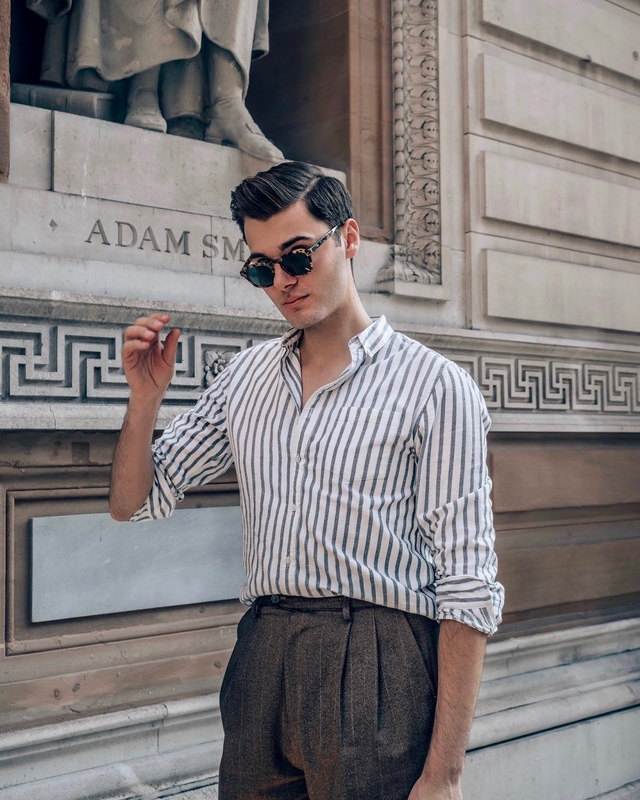 I don't know whether it's been some of my recent searches for holiday inspiration, or my all time love for vintage fashion, but there's something about this look that reminds me of Italy in the 50's and those classic images of well dressed guys on the back of Vespas. 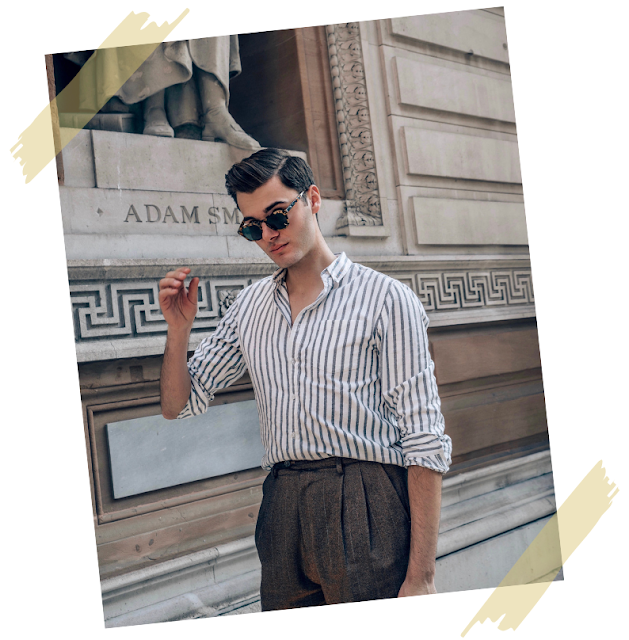 I think the best mens fashion when it comes to spring/summer-wear has to be clean cut tailoring and loose shirts, keeping us guys looking chic but also cool. It managed to reach a pleasant 20 degrees in London this week, which isn't that hot in comparison to other places, but definitely took us Brits by surprise. I have a thing for high waisted trousers, and always have to buy a pair when I find ones I like. The second I saw these on ASOS, I knew they had to be mine. The slight stripe and great fit make these the perfect base for the simplest of outfits, even paired with a simple white tee. 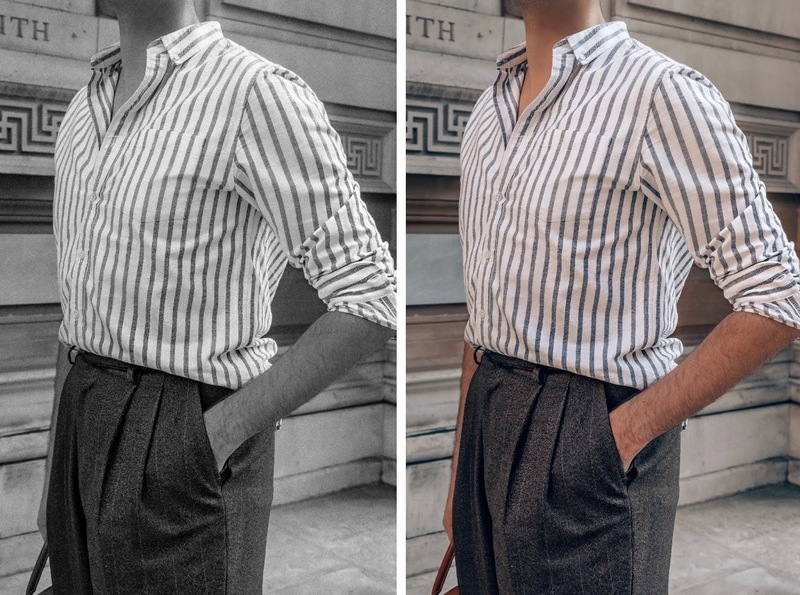 I wanted to keep the top half quite simple, so went for a button down striped oxford shirt, with the sleeves rolled and top few buttons undone. I of course, had to accessorise the outfit with some of my favourite pieces and thought the tan leather made the perfect addition of colour to this look. I grabbed my tan-croc leather bag from Aspinal of London, simple lace up oxford shoes and my sunglasses from Jimmy Fairly, for an added print and point of interest. This look would work just as well with a plain shirt and tie, if you wanted something a little more fashion focussed for the office or occasion, however I think there's something quite charming about the Mediterranean inspired combo, and relaxed shirt option. I think the rolled cuff and open collar add something a little more relaxed, and I definitely found myself swanning around the streets of London as if I were exploring the backstreets of some quaint Italian town. As always, I've linked everything throughout the post and would love to hear what you think about this look.